This novel is a wonderful combination of all things good, a locale shrouded in mystery, murder, intrigue, characters that stay with you long after you finish the book and it all centers around the love of books. What could be better? A friend of mine urged me to read this one. It took me awhile to get around to reading it (so sorry for the delay!) but after reading just a few pages, I knew it was going to be good, so I put it aside to read while on vacation. Each time I opened the book, I felt as if I had stepped inside Daniel’s world. I experienced Barcelona through his eyes…the dark alleyways, the bookstore where he worked, and of course the Cemetery of Forgotten Books. Zafon’s writing is rich with detail, but not overly done. I stopped several times to reread certain passages just because I found them to be so beautifully written. He’s the main character and we see him grow up through the course of the novel. He’s a genuinely kind soul and wants to do what is right. He’s extremely loyal to his friends and when he falls in love, well…we feel his angst. I loved Fermín! He’s fiercely protective of Daniel (for good reason). He’s incredibly pompous but in a humorous way. His eccentricities make for good reading. I found myself chuckling over his antics numerous times. I also caught myself sitting on the edge of my seat over some of his adventures. Nuria is the femme fatale in love with Julián Carax. She is so completely absorbed with Julían that her own life takes a backseat whenever she is with him. We learn more about Nuria as the story progresses but I found her to be such a tragic figure. What can I say about Julían? He is the author of “The Shadow of the Wind” and as Daniel desperately seeks to find the truth about the missing books and Julían in general, we learn all about Julían and the tragedies that he has been forced to endure. This book made a permanent mark upon my soul. Honestly, if you haven’t read it, please do so. You won’t regret it. If the length of the novel seems daunting to you, don’t even pay attention to it because I cried when this book ended and I have NEVER cried over a book. It’s that wonderful. Jill, over at Fizzy Thoughts was kind enough to send me Zafon’s new novel The Angel’s Game. I understand that this one is a prequel to Shadow but that each book stands alone. Additionally, Angel’s Game has the same translator as Shadow (Lucia Graves) which is a big plus because she did such an awesome job with Zafon’s first book. I will probably begin The Angel’s Game next week and I can’t wait! My review for The Angel's Game hasn't posted yet. But, I gave it a 9 out of 10. It thought it was really good, however the ending confused me. I wonder if this one is equally as good, or better. Great review. I have been looking at his new book but thinking I should read this first and wondering if I'd like it. Now to read both of them! The folks that I have spoken to, that have read both said that it really doesn't matter which one your read first. They stand alone. I'm just glad that there is another book for me to read. Everyone seems to love this book. I need to get hold of a copy! Oh my goodness–I've had this book on my wishlist for a while but you've convinced me I need to bump it up. The last book I cried because it was over was Boy's Life, but I think that's probably a pretty different book than this one. This is one of those books I always think I should read and never get around to. I think I even have a copy somewhere! I have this and Angel's Game on my TBR shelf. I really like your "the short of it" feature in your reviews. Knowing this book centers on the love of books is a big draw for booklovers like me. Your review makes me want to read this book very soon! I've had a copy of this for an embarrassingly long time, I should move it up. Did it make you cry because it was just that good or because something specific happened? I'm glad to read such a rousing endorsement of this book. The book club I am in is reading it next month. Wow, after reading this review, I definitely want to read the book. I've heard so many good things about this book and the new one. I've been going back and forth between wanting to read this book and not sure. You have convinced me to read it. Thanks. I am so glad you loved this book. Your review was awesome. I have read this book twice and my blog has a quote from Zafon's book on the header. I used to hand this book out to people when it first came out. I have not read this novel, but continue to hear good things about it and will have to move it up the TBR list. I haven't read his books, but I've seen ANGEL'S GAME getting a lot of buzz. 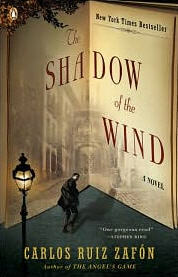 With all the rave reviews/comments I'll have to add THE SHADOW OF THE WIND to my wish list! You know, you really didn't need to send me the postage! But thank you!! I hope you love The Angel's Game just as much. I have this one on my list to read. Great review.